Mothers choose Buggy Baggy as the best baby related project out of several new products on the market today. NEW YORK - Oct. 5, 2017 - PRLog -- On October 1st , Creative Jump brought 100 mothers together and asked them to rate the best baby related product out of 15 random products - carriers, bibs, car seats, feeding dishes and more. The one product that seemed to catch everyones attention was The Buggy Baggy. By the end of the event, Buggy Baggy was voted the best new baby related product with all but one parent declaring it a must have. The Buggy Baggy turns a stroller into a shopping cart or extra storage in no time. No more one-handed stroller pushing, baby carriers on top of grocery carts or juggling baby and groceries at the same time! It allows you to keep both hands on the stroller. Its a carrier for your purchases, a reusable shopping bag and it even free stands in your car for easy transport. When it's time to shop just snap it on your stroller handles and GO! The Buggy Baggy can be used for shopping, festivals, the library, restaurants, the park, amusement parks and many other places. 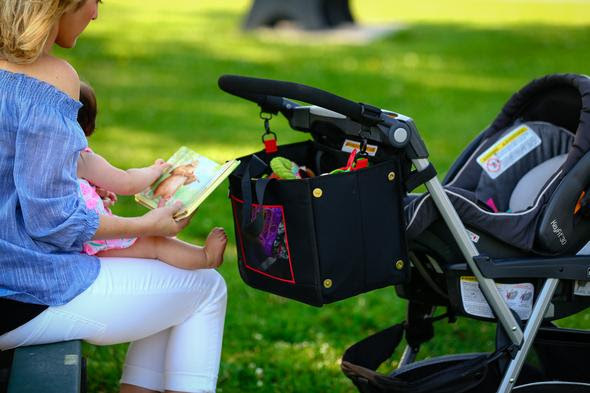 The Buggy Baggy debuted at the ABC Kids Expo with rave reviews and is now garnering the attention of several other news outlets and magazines.